where n + 1 is the order of the polynomial, n is the degree of the polynomial, and 1 ≤ n ≤ 9. The order gives the number of coefficients to be fit, and the degree gives the highest power of the predictor variable. Polynomials are often used when a simple empirical model is required. 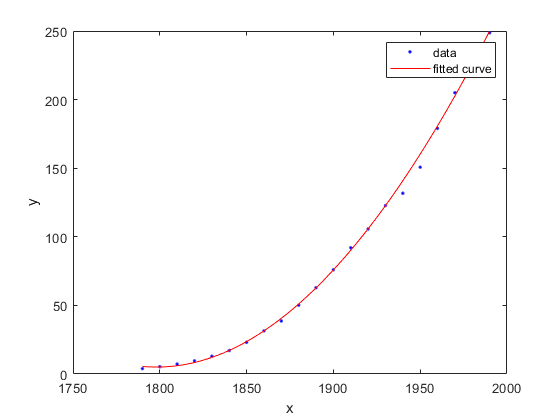 You can use the polynomial model for interpolation or extrapolation, or to characterize data using a global fit. For example, the temperature-to-voltage conversion for a Type J thermocouple in the 0 to 760o temperature range is described by a seventh-degree polynomial. If you do not require a global parametric fit and want to maximize the flexibility of the fit, piecewise polynomials might provide the best approach. Refer to Nonparametric Fitting for more information. The main advantages of polynomial fits include reasonable flexibility for data that is not too complicated, and they are linear, which means the fitting process is simple. The main disadvantage is that high-degree fits can become unstable. Additionally, polynomials of any degree can provide a good fit within the data range, but can diverge wildly outside that range. Therefore, exercise caution when extrapolating with polynomials. When you fit with high-degree polynomials, the fitting procedure uses the predictor values as the basis for a matrix with very large values, which can result in scaling problems. 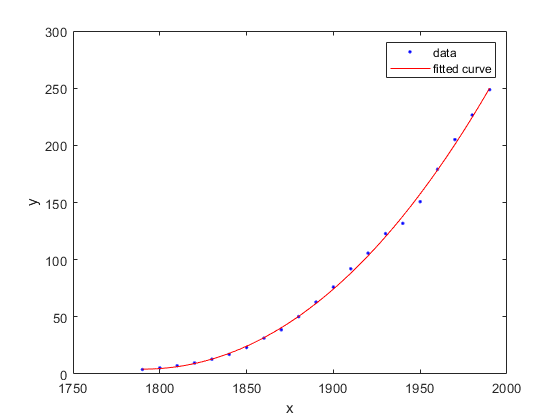 To handle this, you should normalize the data by centering it at zero mean and scaling it to unit standard deviation. Normalize data by selecting the Center and scale check box in the Curve Fitting app. Open the Curve Fitting app by entering cftool. Alternatively, click Curve Fitting on the Apps tab. In the Curve Fitting app, select curve or surface data. If you select curve data (X data and Y data, or just Y data against index), Curve Fitting app creates the default curve fit, Polynomial. If you select surface data (X data, Y data, and Z data), Curve Fitting app creates the default surface fit, Interpolant. Change the model type from Interpolant to Polynomial. For curves, the Polynomial model fits a polynomial in x. For surfaces, the Polynomial model fits a polynomial in x and y. 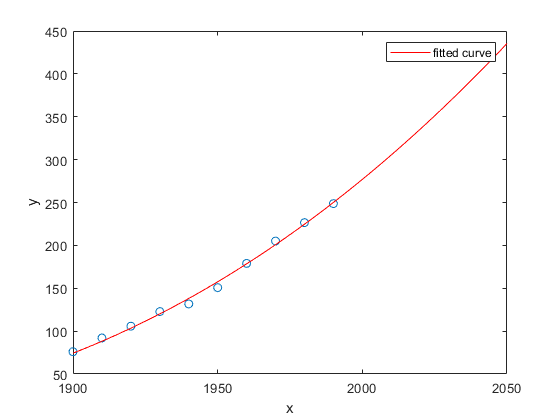 For curves, degree of x can be up to 9. For surfaces, degree of x and y can be up to 5. The degree of the polynomial is the maximum of x and y degrees. See Defining Polynomial Terms for Polynomial Surface Fits. The robust linear least-squares fitting method to use (Off, LAR, or Bisquare). For details, see Robust on the fitoptions reference page. Set bounds or exclude terms by clicking Fit Options. You can exclude any term by setting its bounds to 0. Look in the Results pane to see the model terms, the values of the coefficients, and the goodness-of-fit statistics. If your input variables have very different scales, select and clear the Center and scale check box to see the difference in the fit. Messages in the Results pane prompt you when scaling might improve your fit. For an example comparing various polynomial fits, see Compare Fits in Curve Fitting App. This example shows how to use the fit function to fit polynomials to data. The steps fit and plot polynomial curves and a surface, specify fit options, return goodness of fit statistics, calculate predictions, and show confidence intervals. The polynomial library model is an input argument to the fit and fittype functions. Specify the model type poly followed by the degree in x (up to 9), or x and y (up to 5). For example, you specify a quadratic curve with 'poly2' , or a cubic surface with 'poly33' . Load some data and fit a quadratic polynomial. Specify a quadratic, or second-degree polynomial, with the string 'poly2' . % Plot the fit with the plot method. % Move the legend to the top left corner. Fit a cubic polynomial 'poly3'. The cubic fit warns that the equation is badly conditioned, so you should try centering and scaling by specifying the 'Normalize' option. 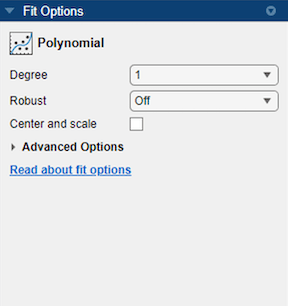 Fit the cubic polynomial with both center and scale and robust fitting options. Robust 'on' is a shortcut equivalent to 'Bisquare' , the default method for robust linear least-squares fitting method. 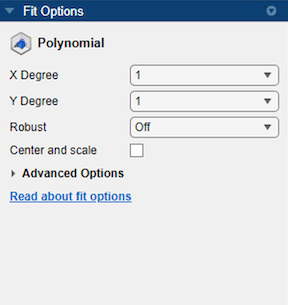 To find out what parameters you can set for the library model 'poly3' , use the fitoptions function. Specify the 'gof' output argument to get the goodness-of-fit statistics for the cubic polynomial fit. To plot residuals, specify 'residuals' as the plot type in the plot method. By default, the fit is plotted over the range of the data. 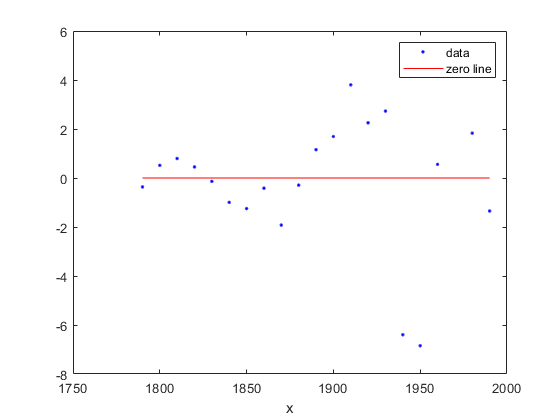 To plot a fit over a different range, set the x-limits of the axes before plotting the fit. 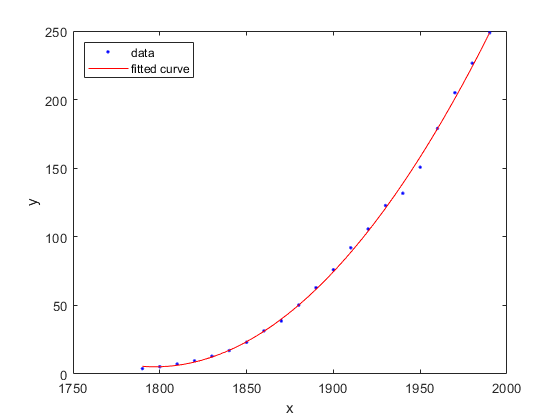 For example, to see values extrapolated from the fit, set the upper x-limit to 2050. 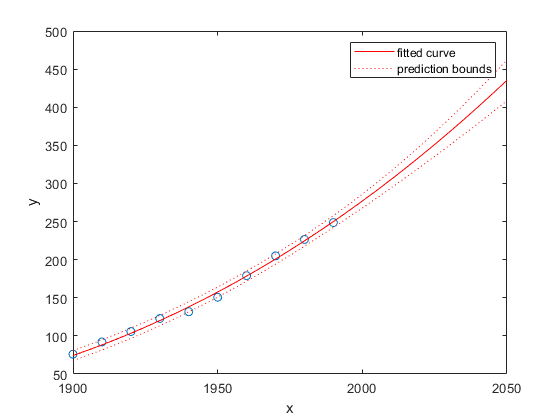 To plot prediction bounds, use 'predobs' or 'predfun' as the plot type. 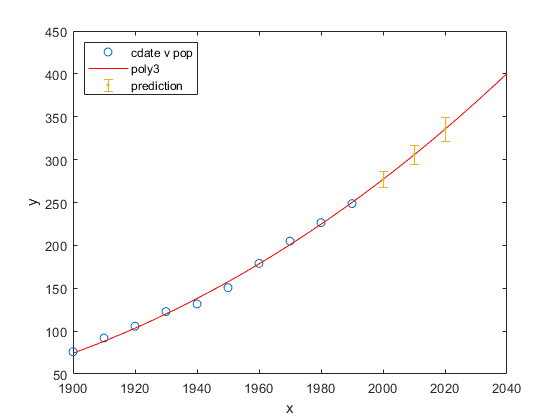 Plot prediction bounds for the cubic polynomial up to year 2050. Evaluate the fit for some new query points. 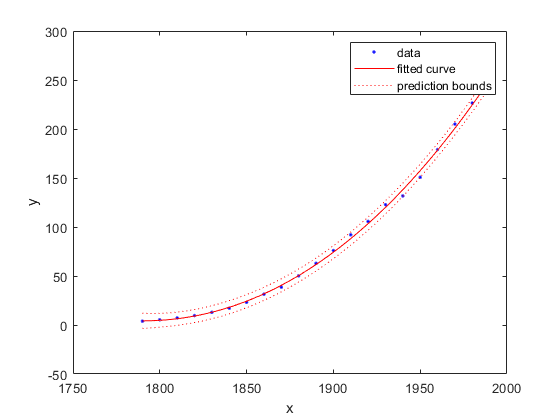 Compute 95% confidence bounds on the prediction for the population in the future, using the predint method. Plot the predicted future population, with confidence intervals, against the fit and data. 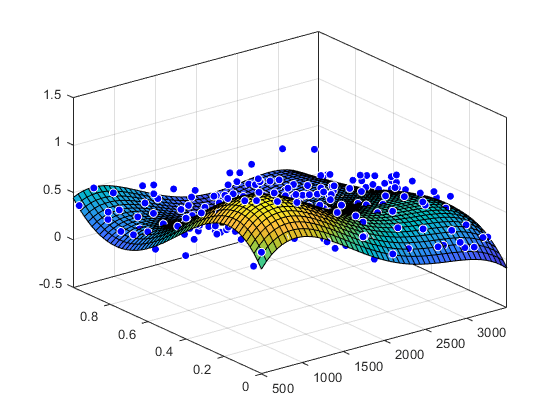 Load some surface data and fit a fourth-degree polynomial in x and y. All fitting methods have the default properties Normalize, Exclude, Weights, and Method. For an example, see Specifying Fit Options at the Command Line. Polynomial models have the Method property value LinearLeastSquares, and the additional fit options properties shown in the next table. For details on all fit options, see the fitoptions reference page. 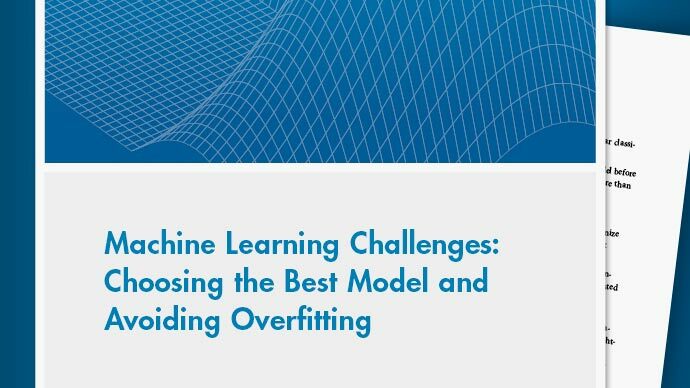 Specifies the robust linear least-squares fitting method to use. Values are 'on', 'off', 'LAR', or 'Bisquare'. The default is 'off'. 'LAR' specifies the least absolute residual method and 'Bisquare' specifies the bisquare weights method. 'on' is equivalent to 'Bisquare', the default method. A vector of lower bounds on the coefficients to be fitted. The default value is an empty vector, indicating that the fit is unconstrained by lower bounds. If bounds are specified, the vector length must equal the number of coefficients. Individual unconstrained lower bounds can be specified by -Inf. A vector of upper bounds on the coefficients to be fitted. The default value is an empty vector, indicating that the fit is unconstrained by upper bounds. If bounds are specified, the vector length must equal the number of coefficients. Individual unconstrained upper bounds can be specified by Inf. You can control the terms to include in the polynomial surface model by specifying the degrees for the x and y inputs. If i is the degree in x and j is the degree in y, the total degree of the polynomial is the maximum of i and j. The degree of x in each term is less than or equal to i, and the degree of y in each term is less than or equal to j. The maximum for both i and j is five. For example, if you specify an x degree of 3 and a y degree of 2, the model name is poly32. The model terms follow the form in this table. The total degree of the polynomial cannot exceed the maximum of i and j. In this example, terms such as x3y and x2y2 are excluded because their degrees sum to more than 3. In both cases, the total degree is 4.